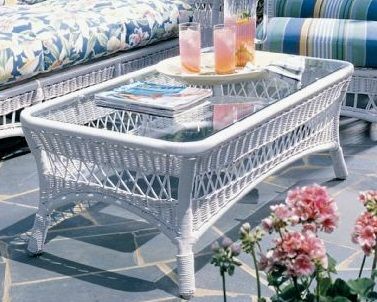 The Lane Venture Bar Harbor Vinyl wicker coffee table in white is suited for total outdoor use. Wicker is the tight weave of materials, which can differ in style, and they are known to be very resilient for outdoor use. They also give your patio a fresh, new look and compliment just about any landscaping you may have done. This Lane Venture wicker furniture for sale comes in white, and has an attractive piece of glass across the face of the table. It is the perfect garden icon, and will give your home that old-fashioned touch you’ve been looking for. Perfect for areas that receive a moderate amount of rain.